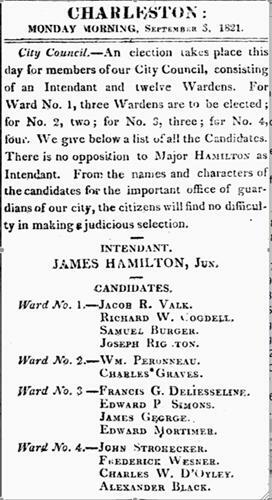 Elected intendant September 3, 1821, succeeding Elias Horry. Re-elected September 2, 1822; resigned December 24, 1822, after being elected to the United States Congress. Succeeded by John Geddes, January 6, 1823. Born 1786, died November 15, 1857, lost in shipwreck off Avery Island, Louisiana. Son of James Hamilton and Elizabeth Lynch, married Elizabeth Heyward 1813. Educated in Newport, Rhode Island, and Dedham, Massachusetts. Attorney, admitted to bar 1809; practiced briefly then took position as secretary to Governor Henry Middleton. 1819-1823 practiced with James L. Petigru. 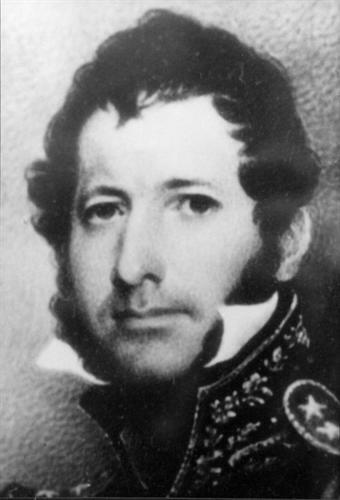 Commissioned lieutenant in U. S. Army during War of 1812, served in New York. Owned (through his wife) rice and cotton plantations in St. Luke's and St. Peter's parishes, Beaufort District. Acquired plantations in Georgia, Alabama, Mississippi, and Texas. Represented St. Philip's and St. Michael's parishes in State House during three General Assemblies, 1819-1822; and in the Senate for two terms, 1834-1837. Served in U. S. Congress 1822-1829 (first elected to fill the unexpired term of William Lowndes, re-elected three times). Governor of South Carolina 1830-1832. Loan commissioner for Republic of Texas, 1838-1842.